Colleen Daly sits in her office under a black and white photo of the 17 original founders of the Community Library. It's a poetic moment for the soon-to-be former executive director, Daly is moving on after seven years of building and strengthening the original vision of that formidable group of women. She has been lured away to work as development director of the American Academy in Rome. She said that as the oldest American overseas organization focusing on independent study and advanced research in the arts and humanities, the academy provides students who are top in their field the opportunity to live in an incredible place and pursue their own studies or art. She will be based in Manhattan but travel frequently to Rome. 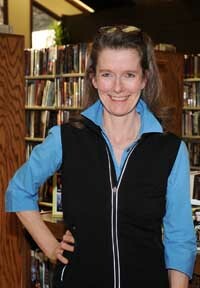 Daly first started working for the Community Library in 1981, after answering an ad in the Idaho Mountain Express for a front desk assistant. "I'm a book person in my very DNA," Daly said. "Getting a job at the library was like putting a kid in a candy store." The Express sat down with Daly to take a look back at the progress of the Community Library on her watch. Idaho Mountain Express: Which accomplishment are you most proud of from your time at the library? Colleen Daly: Ramping up the cultural programming from an average of one program a month to almost 100 programs in 2011. It was clear to me that the library was metamorphosing, that it was not just about books any longer. IME: How do you feel the library has grown and developed during your tenure? CD: The library has always been considered a wonderful, beloved and important resource in the valley, but I think in the last seven years it has taken its rightful place as an engine for cultural programming. More than just a fabulous collection of books, it is a place where things happen. As well, the staff, the board of trustees, the development efforts and most recently the Gold Mine have all become more professional in focus and delivery of product. All this has happened without sacrificing any of the charm and grace and high level of customer service for which the library and Gold Mine have had well-deserved reputations. IME: What do you see as the library's biggest challenge going forward? CD: As always, we need to get the word out that the library, a public library, is not financed by tax monies on any level. The community needs to understand that it is funded by contributions from individuals and foundations, and that the proceeds from the Gold Mine cover 30 percent of our operating expenses. IME: How would you sum up the personal enrichment you found from this role? CD: It's been the most challenging and the most rewarding job that I've ever had, in every way—personally, professionally. The job was so much more than I could ever have imagined it would ever be. IME: What goal did you have that you were not able to achieve? CD: From almost the beginning I tried to recruit someone who would drive a Friends of the Library organization and professionalize the volunteer element of the institution. Somehow we've never been able to attract anyone who wanted to take on what is a big, fun, important position. IME: What will be your best memory of your time here? CD: I have an indelible memory of our first Fiestas Patrias Day. We invited the Spanish-speaking community into the library and served tamales and tres leches cake, we had piñatas and dancing. There were more than 500 people in the library, many of whom had never stepped through our doors before. At one moment I looked up and the stage was filled with beautiful young people with flowers in their hair, wearing white dresses and red sashes that they were using to reel one another around. I burst into tears. It was so lovely. IME: What piece of advice would you like to give the community, based on your time here? CD: I hesitate to give any advice, but perhaps I would like to acknowledge the importance of collaboration and cooperation, an approach the library has embraced with other organizations in town, an approach that has proven spectacularly successful in every which way. We live in a bubble here. It's a great bubble. But living in a place where there's no ethnic diversity is a tragedy, especially for the young people. ... Travel and books play a vital role in helping individuals understand that the other is not so different from us, when we understand that, we develop a greater tolerance for diversity.